10. The Life of Samuel Johnson, LL. 20. The life of Samuel Johnson, LL. 3. Boswell's life of Johnson. Edited with an introduction by Mowbray Morris. The Globe edition. 7. 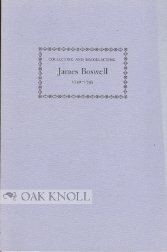 Collecting and Recollecting James Boswell 1740-1795. A Bicentenary Exhibition from the Collectors of Yale University and Four Oaks Farm. 8. 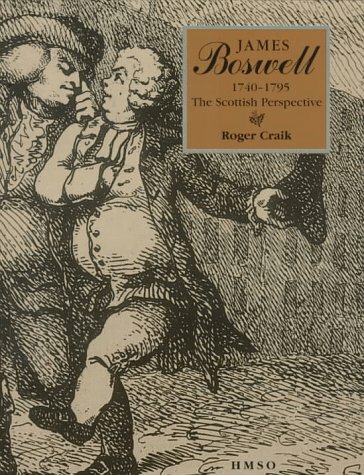 COLLECTING AND RECOLLECTING JAMES BOSWELL 1740-1795. 10. The Life of Samuel Johnson, LL. D. Comprehending an account of his studies and numerous works, in chronological order; A series of his epistolary correspondence and conversations with many eminent persons; and various original pieces of his composition, never before published: The whole exhibiting a view of literature and literary men in Great-Britain, for near half a century, during which he flourished. In Three Volumes. The second edition, revised and augmented. 13. 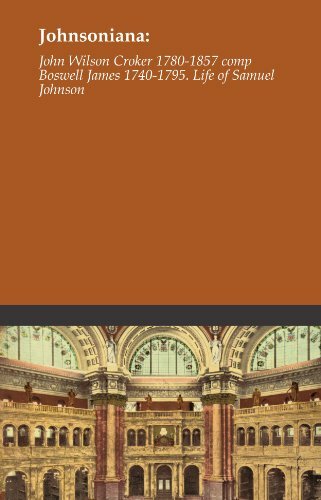 The Journal of a Tour to the Hebrides, with Samuel Johnson, L.L.D. I've never been a fan of Samuel Johnson.The greater writer and more interesting character, to my mind, has always been Boswell.I don't doubt that Boswell had a sincere affection for the man, but I sometimes wonder if Boswell (perhaps subconsciously) duped Johnson into letting him write his biography as well as this account of their travels to show him up.Time and time again, Johnson shows himself to be, well, a curmudgeon, both in word and deed.From his comments on Hume, the great Scottish philosopher and historian, "I know not indeed whether he has first been a blockhead and that has made him a rogue, or first been a rogue and that has made him a blockhead." to his ordering Boswell back by his side when Boswell was just trying to ride ahead and prepare things for his arrival (all according to Boswell, of course), Boswell's Johnson does not come off very well.Though Boswell attests to his worship of the "Great Cham" again and again, one can't help wondering if there was a smirk on Boswell's face as he penned this journal of their travels...Surely, it had to have occurred to him that readers would come away with a snicker or two at his descriptions of what almost seems a straw man for Boswell's sharp pen.I, for one, am not convinced by his show of naive devotion to Johnson.-What then was Boswell trying to do?Make a name for himself, of course.And what better way than to associate himself indelibly with the man many considered the greatest literary figure of the time.-He was very successful in doing so, and his writings are now much more in demand by readers than anything written by Johnson, who, in turn, has turned out to be the "harmless drudge" he ironically defined himself as in the dictionary that made him famous.Finally, then, my verdict on the book is that it is passing weird.-Weird, in that the psychological interplay always just below the suface in Boswell's account of the journey leaves the reader in constant doubt throughout the book as to Boswell's true intent in writing his descriptions of Johnson.-Was Boswell smirking with a mercenary eye to the future of his own literary reputation, writing ludicrous descriptions of a man considered great at the time, all beneath a faux-naif bluster?-I, for one, am convinced that, at least subconsciously, he was.-But this is what, for me, makes the book so much more intriguing than your average day-in, day-out journal.-4 stars though because it's still a journal and makes for yawns at times. 14. The Journal Of A Tour To The Hebrides, With Samuel Johnson, Ll.d. By James Boswell, ..